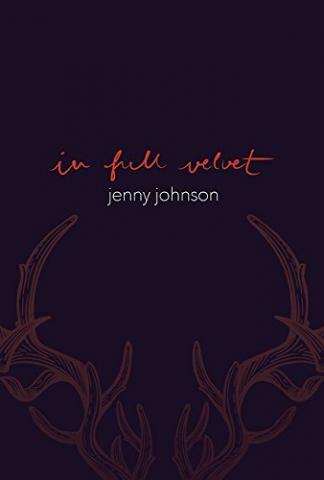 Jenny Johnson’s debut book In Full Velvet is a stunning collection of formally composed poems. 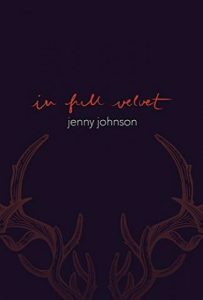 By adopting and pushing against poetic form, Johnson sustains a tension that expresses a wide emotional range, including joy, rage, desire, love and need for acceptance. The poems throughout this book explore how we think of the body, gender identity and the relationship between nature and love. In Full Velvet opens with “Dappled Things,” which references the first line of “Pied Beauty” written in 1877 by Gerard Manley Hopkins. Additionally, Johnson adopts a poetic form attributed to Hopkins. “Dappled Things” comprises eight curtal sonnets—a sestet followed by a quatrain and a final half-line. This modified sonnet form is used by both poets to celebrate the unconventional. Hopkins’s poem is often viewed as an apology, a literary defense of natural objects not typically considered to be beautiful. Johnson’s poem, too, serves as a type of literary defense of “all that’s still somehow / counter, original, spare, and strange,” including “the alien markings on my girlfriend’s cheek and how / they form a perfect triangle.” This is where Johnson moves in her own direction, using a nineteenth century form to celebrate, explore and defend the LGBTIQ community. While noting the overlap between nature and artifice in contemporary society, Johnson raises questions regarding moral responsibility, harmony and exploitation. Is it possible for human beings to live solely within the law of nature without human engineering? Where is the healthy balance between the two, if there is one at all? It’s also true that some whitetails never lose their velvet. all our visible and invisible parts. are idealized, some degrading, some compulsory, some transgressive. These lines refer to the visible (such as the physical body) and the invisible (such as emotional being). This is a central conflict in In Full Velvet. Many of Johnson’s poems explore the relationship between body and being, specifically, how the body influences who we are, how we are perceived and who we love. we were born beneath. You know what I mean? A starling with supernatural restraint. Lines such as these demonstrate power and vulnerability, not to mention mastery of poetic skill. And yet, they are just excerpts from a collection of poems that sustain an emotional intensity and poetic virtuosity worthy of the recognition it has garnered. Amy Seifried’s work has appeared in Water~Stone Review, Schuylkill Valley Journal, Philadelphia Poets, and Pittsburgh City Paper. Formerly a legal writer in New York City, she recently completed an MFA in Poetry from Drew University, and lives in my hometown of Pittsburgh, PA.